Once you decide to blog, then comes the question of 'where' to blog. In this article, I list some of the popular and emerging choices. Blogging is at the heart of online marketing for businesses. Blogging helps businesses to communicate their vision, their take on their industry and how they will shape the industry. Regular blogging also attract leads. If they sell online products, they might even make a sale through their blog. Once you decide to blog, then comes the question of ‘where’ to blog. In this article, I list some of the popular and emerging choices. Hosted platforms take the pain of installing and maintaining a blog. You signup, login, and start publishing your articles. The hosting company takes care of every technical details of running a blog smoothly. If you are starting to blog, then you should start with one of the free hosted platforms. It comes with a disadvantage though. You can’t customize the design of these hosted blogs much. Here are some of the hosted platforms. Wordpress: The most popular blogging platform. It powers quarter of the top million blogs. It comes in all variety. You can start for free with their hosted platform or download their platform and host it yourself or if you can afford, you can use their expensive VIP platform. Though I run a competing platform, I have great respect for the way they build their business. Ghost: Ghost is similar to Wordpress. You can download and host it on your own host or you can start with one of their offering. Their hosting solution starts at $8 / month. Postagon: Tagline for Postagon is ‘Blogging for Minimalists’. It supports markdown, custom domain, and posting via email. It costs $4.99 per month. Medium: This is a new-age article directory like EzineArticles. Medium has large following and hence attracts lots of readers. It has beautiful design and has no ads. Those are the two differences between EzineArticles and Medium. Lot of bloggers, cross-post their articles on Medium to gain readers. You can start for free with a twitter login. Postach: Many people use Evernote for storing their notes. Postach takes an Evernote notebook and turns that into a beautiful blog. You can start with $9 / month. Weebly: Weebly is a website builder. You can build a blog and e-commerce store too. You can start for free and then upgrade to other plans. Silvrback: Yet another hosted blogging platform with Markdown support. It costs $29.99 / year. Hosted platforms are easy to start, but they also come with constraints. You don’t own the end product — your blog. I don’t mean the legal rights of your writing, but the blog with its contents and design. If the blogging platform shuts down, like Posterous did, then you are forced to migrate elsewhere. Self-hosted platforms eliminate that uncertainty. Additionally, you can customize the look and functionality of your self-hosted blog to your desire. As I mentioned earlier, you can download both Wordpress and Ghost host on your own servers. They both are open source software and offered free of cost. Statamic: Calls itself, the flat file CMS with superpowers. Instead of database, it stores everything in flat files. It costs $29 to start for a personal site. Jekyll: Jekyll popularized the notion of static blogs. You install Jekyll locally, write your posts in Markdown format, generate the blog using templates, and then upload to your host. You could host the generated blogs on your own webserver, or Amazon S3 or on Github. Statiked: Statiked is a native Mac OSX application, which you can download from Mac Appstore. It costs $19.99 for one time download. You write your posts locally, generate the blog and upload to Amazon S3 or Github Pages. Cactus: It is a free Mac Application to generate static sites. You write locally, generate the blog and upload to Amazon S3. There are many other static site generators. You should have a look at the entire list to pick one. Static blog generators boost the performance of a blog and make the blog secure. But they also introduce a constraint. You can blog only from the machine you installed the static blog generator. 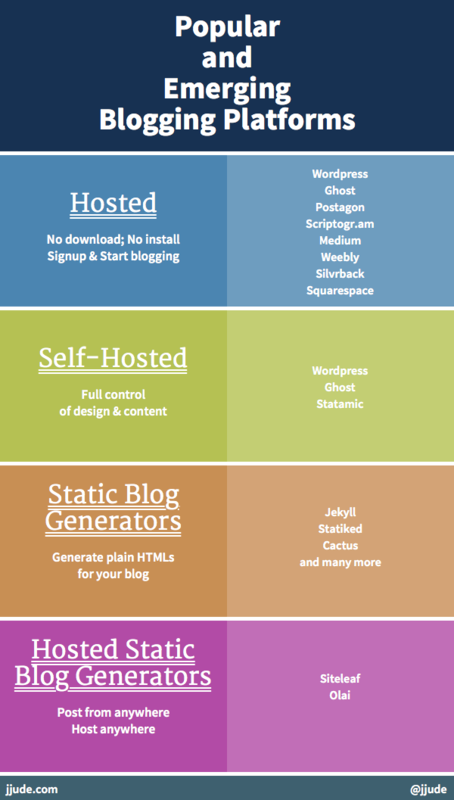 Hosted static blog generators gets the best of both systems – they generate plain HTMLs as like static blog generators; they are hosted like CMS so you an write from anywhere. Siteleaf: Siteleaf supports all features of a regular CMS like Wordpress. You can host with them or host your site at any web-host. You can also collaborate with your team in drafting your articles. You can start for $9 / month for one site. If you are a startup or a small business, you should have a blog and update it regularly. My recommendation, obviously, would be Olai. But it doesn’t matter. Start with Wordpress, if you have to. Build your business through content.